Going by your review I have to agree that starting with level 2 would be wise if the child hasnt already had lessons before. I am glad we got Level 2 here, we still had a review to go through first but it wasnt really hard. Great review! Thanks for your review, Debra. It helps me to realize that if we should choose to do Greek again next year that we should probably choose a lower level to plan to supplement the review portions somehow in order to maintain interest. Beth -- glad to hear my assumptions about starting at Level 2 were reasonably good. Michelle -- well -- I have used the Greek materials (levels 1 and 2, and I own some of 3), and I don't think that it is really comparable in that respect. Go check and see when Tess does her review of Hey Andrew Level 3, for the perspective of someone who *started* there. But *my* take, for your kids, would be that you probably could jump to Level 3. Lessons 1 & 2 review the alphabet, which your kids would know after working through Level 1. Then there are only TWO lessons of vocab review, with only one word per page, followed by a practice page on that vocab word. 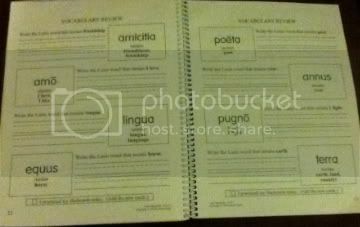 So Lesson 3 reviews FOUR vocabulary words. In total. A man, a brother, an apostle, and I see. Lesson 4 is also vocab review. TWO words. I know, and "and". And then you're done with review. SIX vocabulary words is quite different from FIFTY. Totally different. Totally. And honestly, in looking at this, I'm back to thinking maybe I should be using Level 3 of Hey Andrew. 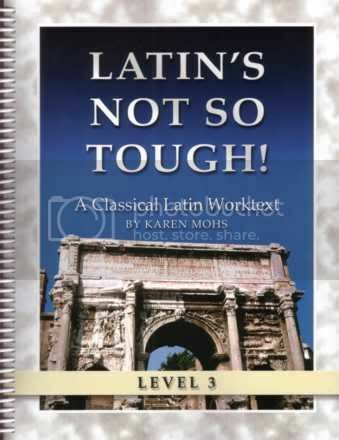 @Debra, wow, boy am I glad I got Greek and not Latin! @Michelle, I just posted my Greek level 3 review. It is NOT like the Latin at all. Much more reasonable with the review. I would NOT want to start Hey Andrew below Level 3 with a child over age 10. We've made it work here. Don't let the Latin discourage you from the Greek.